Valentine’s Day isn’t really a huge deal in my house. I don’t have small children and my teenagers think the holiday is a bit cheesy right now. My husband and I are not particularly the ‘romantic’ sort of couple. There is no flashy jewelry, trips to the spa or exotic vacations in store for us on Valentine’s Day. But, I still want to do something simple for my husband to let him know I love him. He is, of course, the guy that kills cockroaches and unclogs drains. He deserves a little something special now and then! 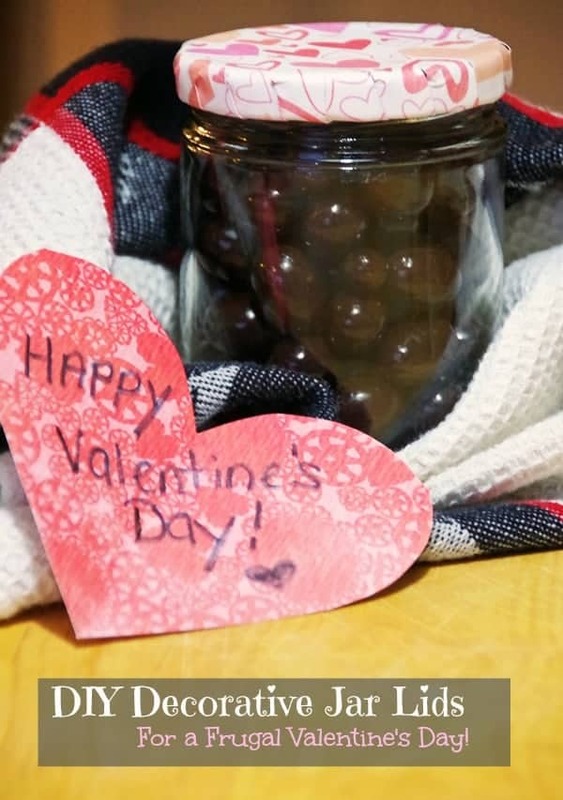 These decorative jar lids are the perfect way to turn your old jelly jars into an upcycled Valentine’s Day Treat Jar! Decorative jar lids can be tailored to any occasion and just about every person. Depending on the type of scrap book paper used, you can make a treat jar for the dog (use paw prints), a jar to hold candied nuts as a Christmas gift, or just match the paper to your bathroom and store cotton balls and Qtips in them. No need to throw away that jar when there are so many creative ways to reuse them! For this upcylced Valentine’s Day Treat Jar I used Martha Stewart scrap paper. 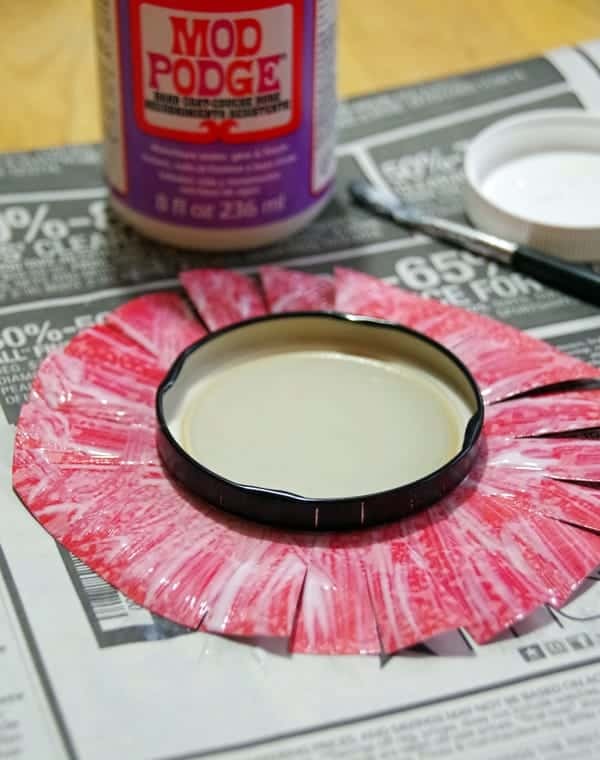 Just place your clean jar lid upside down on the paper and cut out a circle about 1 inch wider than the lid itself. 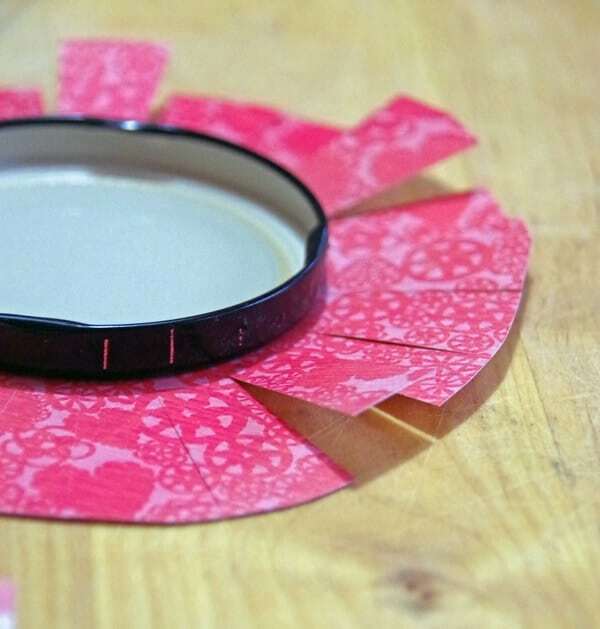 Place the jar in the center of the scrap paper circle and make a cut from the edge of the paper inwards towards the lid. Repeat this process all the way around the lid. 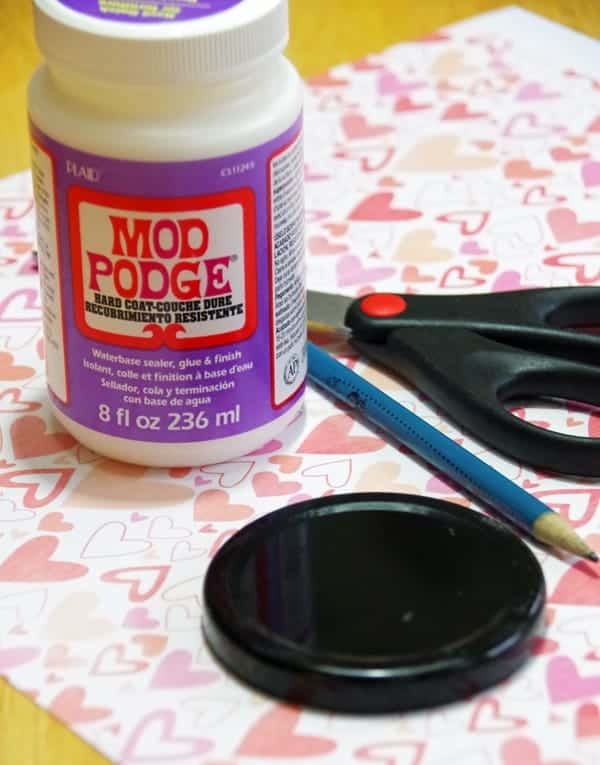 Cover the paper with Mod Podge all the way from the center to the edge. Fold up the strips of paper and tuck them inside the jar lid as shown. Go all the way around the lid until the entire lid is covered and all strips are secured inside the lid. Let the decorative jar lids dry before you secure them to your jars or you will never get your jar open! Fill your Valentine’s Day Treat Jar with your honey’s favorite treat. 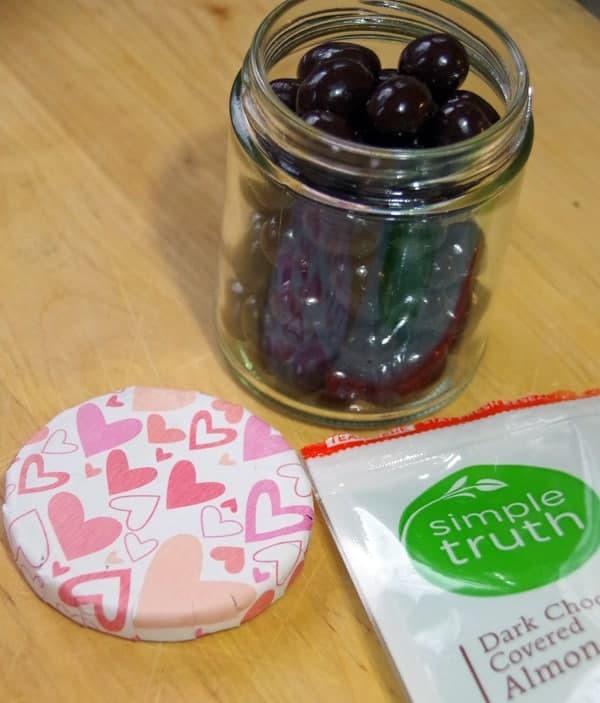 My husband is a huge fan of chocolate covered almonds so that is what I put in our upcycled treat jar. Now I have a sweet yet simple way to tell my husband I love him that didn’t cost much at all to make! 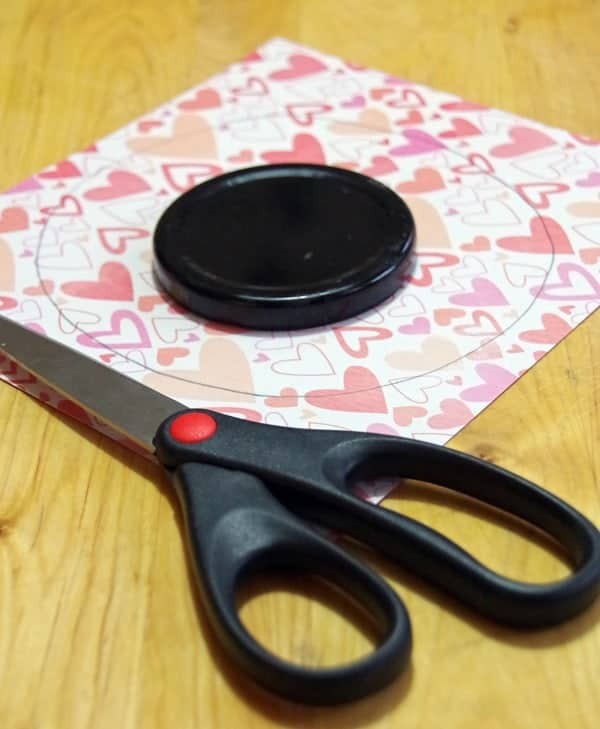 Do you have any frugal or upcycled Valentine’s Day ideas you would like to share? Love this idea! It's so much more thoughtful and personal than buying something off the shelf! I think I might do this for my boys this year because I will be out of town for Valentine's day. Diane, I had no idea it was so easy to make decorative jar lids! My kids will love having customized lids for their storage jars - thanks for the tutorial! glad to help! Hope it comes in handy! I love your craft idea. In fact, I could do something similar for teacher's gifts during the holidays. You made the tutorial so easy. Very true! Would make a nice teacher gift idea! Im thinking of doing it for the pantry, too! I store lots of grains and beans in glass jars! Such a cute gift idea for Valentine's day. I love the paper you chose. There are so many great things to place in the jar. Very clever. I love this! I confess to hoarding nice sized glass jars and reusing them for gifts but never with cute lids like this. Totally doing this!